A terrible beauty. Photo by Tara Todras-Whitehill / AP. William Butler Yeats penned those lines after the Irish Easter uprising of 1916. And how haunting and true they remain. 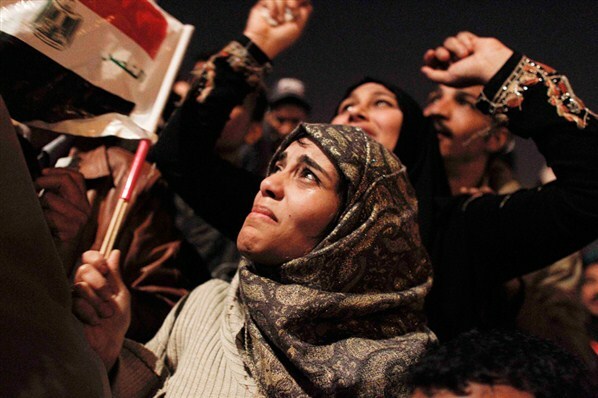 Watch the explosions of joy at Tahrir Square and across the Middle East. The people of Egypt have changed much more than the experts grasp in their cramped little calculations of power and containment can even imagine. They have shattered the myths of powerlessness, the notion that a regime built on repression and violence is impregnable. For a generation, in the Middle East and around the world, the smothering blanket of cynicism, hung over demonstrations, mobilizations, and activism. But the people of Tunisia and Egypt have shattered that picture. They have reinvented once again, as every generation must, the innovative dance that is a mass movement. Gone -- or at least for a long time -- is the idea that the people cannot make history. The Israeli authorities like to claim that they are the only democracy in the Middle East. Sadly, though, they seem to balk whenever democratic efforts are attempted. The Egyptians have shattered the myth that Arabs have no interest in, or understanding of democracy. Hillary Clinton, in a U.S. effort to slow down the struggle, has recently discovered that Egypt has a constitution and decided it must be followed. This had not been a problem to the U.S. for all these years that martial law was imposed. Giving the dictatorship $1.5 billion per year, mainly for military hardware, has been a burden on the people that they won’t soon forget. Other authoritarian regimes, from Saudi Arabia and Libya to China and Burma, must be wondering when and if the same fate awaits them. And people are stirring in all these places. Many of us recognize that the U.S. empire, that costly and violent hegemony that each administration seeks to preserve, is slowly crumbling. The Egyptians remind us that this is not something to fear. It can also be something joyful, creative, and hopeful. Watching Tahrir Square, I’m sure many in the U.S. begin to imagine how much more lovely it would be to live in a world with greater equity in the distribution of resources, with a real participatory democracy, and with the possibility of deep human solidarity. Many dangers lie ahead. But the genie is out of the bottle and cannot be stuffed back in. It is indeed true: a terrible beauty is born.